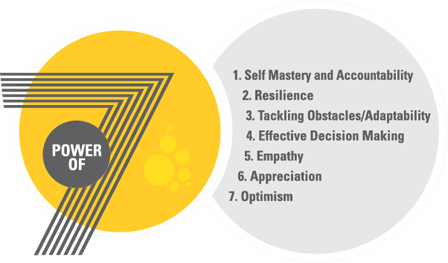 The power of 7 is qualities SIS believes are essential for the success of each individual. At SIS the curriculum and events have been customized to ensure that students become habituated to following these essential values. Stressing on the power of 7, we ensure that student’s achieve excellence in all aspects of life. Self-mastery ensures that one has clarity and focus. It outlines what is important to an individual and ranks it according to personal and professional priority. It allows one to make plans and work towards achieving them to be able to manifest one’s aspirations. As a leader, it is important to be able to give direction to oneself and one’s team. 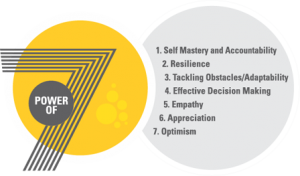 Well-developed self-mastery allows a person to be authentic, courageous, confident and passionate. Accountability is like rain—everyone knows they need it, but no one wants to get wet. However SIS holds special importance for this trait. Accountability is not about simply taking responsibility for your actions but about rising above excuses. It allows you to make mistakes and learn from them. It allows one to walk the path of continual improvement and gradually raise their own standards of achievement. Attaining clarity on one’s short term and long term goals and creating disciplined methods to achieve them. Being morally accountable for one’s actions and decisions, and ensuring that one has a trustworthy and dependable character. Success is not defined by the name and fame earned but by the path a person follows, the morals and values one stands by. Making ethical choices is not always as easy, yet of utmost importance as a leader. It is important to analyze the situation and understand the most ethical solution. Resilience allows one to take charge of one’s life and team and work towards achieving those goals in an ethical and value based manner. This ensures that we are creating more responsible citizens for tomorrow. To have the ability to stand up and take charge of one’s life and achieve one’s goals in an ethical manner. Moreover to take initiative during tough situations and emerge as a leader. Overcoming each obstacle allows one to grow stronger as an individual and become an ideal leader during difficult times. To maintain constructive and composed focus while facing tough situations in life and overcoming these obstacles confidently. Choices are placed in front of us every moment of the day, some smaller than the others. However choosing the correct course of action in accordance to our environment and other situations is an essential skill not only for leaders, but for every individual who wants to succeed. Decisions are made through intuitiveness and reasoning, a balance between the two is highly essential for making effective decisions. The ability to make decisions on one’s own accord allows a person to think and freely make mistakes and correct them. To make timely, effective and practical decisions and facilitates others in doing the same. Empathetic people are skilled in placing themselves in the shoes of other people and seeing their perspective. It is one of the main components of emotional intelligence. Developing positive interpersonal relations requires empathy skills like listening to others, understanding verbal and non-verbal cues and appreciating the differences in others and their beliefs. Developing these skills allows one to deliver satisfaction in all relationships and have pleasurable and effective interactions. To develop an attitude of deference, admiration, regard and esteem other people, irrespective of their education, profession, income or caste. Hence ensuring the development of an equalitarian perspective towards the world. Gratitude shifts your focus from what your life lacks to the abundance that is already present. Research has shown that an attitude of gratitude makes people more positive and resilient. Additionally it strengthens relationships, allowing people to build stronger bonds. It has also resulted in higher levels of alertness, enthusiasm and determination. All qualities required to excel. Moreover gratitude goes beyond searching for the small things in life but to constantly look for the good in unpleasant situations, making such situations more endurable. Being grateful allows one to see the bigger picture and gives one vision, aiding them in making greater progress towards their personal goals. To learn the art and value of being grateful for all that one gets from life and continuously seeks to positively influence other people’s life, through gestures of kindness. Mishaps are always taking place, what makes the difference is how one addresses and endures these hardships. Success is correlated with optimism. Optimism is important for accomplishing goals, as it is the foundation of courage, confidence and true progress. Having a positive outlook outlines hope and ensures that one is not brought down by criticism. Having a positive outlook ensures that you determination doesn’t deter, and obstacles are destroyed as and when they arise. Optimism is associated with a winner’s attitude, because winners have embraced failure and raised above it. They don’t determine their rewards based on what happens to them, but how they perceive these events. To learn to divert one’s focus on the positive aspects of life rather than the negative. To work with one’s dream, aspirations and hopes and keep oneself motivated by them.